Who is Publishing the Truth About the MEK? After the fall of Saddam more than two years ago, those members of the Mojahedin-e Khalq organisation who were considered 'useful' to the organisation were clandestinely shipped to Europe, Canada and America. Some of these members have undergone extensive intelligence and guerrilla warfare training by the Intelligence services of Saddam Hussein, and many have over 20 years experience in their fields. 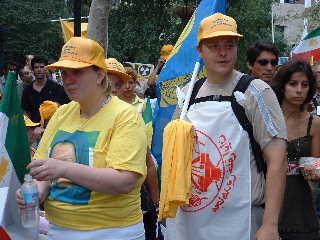 These people have no regard for their own or other people's lives and are ready to kill and die to order - they demonstrated this capacity when they staged self-immolations to protest the arrest of the cult leader Maryam Rajavi in 2003 in which two persons died and several others became permanently disabled. 1- Surveillance - general and specific, using sophisticated methods and equipment which is purchased and adapted according to their needs, including laser and other techniques of eavesdropping. They have been trained how to follow every movement of their unsuspecting victims over long periods of time. 2- Making false ID and other documents. These are used to facilitate undetected movement of the agents, as well as using the false ID of their victim to undertake all kinds of activities (illegal, etc) which will get them tangled up with the authorities. 3- Training in voice change in order to pretend to be someone else so they can debrief people over the telephone. They use this method to gather information about their victims and their surroundings. 4- To arrange accidents (fatal or otherwise) to befall their victims. 5- Creation of databases which can be cross linked. The data base is the most important source of information when they enter the "operational phase". 6- Adaptation in the society in which they operate, and the use of available resources like making friends, forming connections with the police, connection with the authorities, connection with criminals so as to misuse them in the "operational phase". 7- The ability to become a new person with a new identity and to lose all traces of their past after performing specific operations. 8- Smuggling people, arms and other materials directly or with the use of local and international smugglers. 9- Psychological methods of putting pressure on their victims in order to either unbalance them (to make them react and force illegal reactions) or to send a message of power so as to stop them from doing something or to make them do something. 10- Suicide bombing, self immolation, terror acts using psychological methods as well as using specific drugs. 11- Money laundry, illegal transactions, illegal transfer of money between countries, using bogus companies and establishments to misuse real banks and financial establishments for their aims. 12- Infiltration of political parties, humanitarian organizations, etc, as well as recruiting people as agents in governmental and non governmental establishments. 13- Interrogation and counter interrogation training. We should remember that some of the people who have been shipped in to European countries have been trainers in their own field for many years. Faced with the dismantling of the MKO's military apparatus (Saddam's Private Army) in Iraq, the organization restructured all its resources into its intelligence section and moved its HQ from Iraq to Europe. The MKO's intelligence section's HQ at this moment of time is in the city of Cologne (Germany), which now after two years, has a network of well established clandestine branches all over Europe, the USA and Canada. The covert connection and communications between these branches, the Cologne HQ and the overt base of the MKO in Auvers sur Oise (suburbs of Paris), are maintained only by persons traveling between these places (they do not use any emails or telephones - they even switch of their mobiles and take the batteries out when approaching their safe houses). Over the past two years the operational department of the intelligence section has evolved to its full potential and is now active in European countries carrying out the specific assignments given to them. 1- to plan and execute operations against the disaffected members of the organization in order to stop them from exposing the organization's past and present activities. The HQ has given an open hand to use all means necessary for this mission. The operation includes character assassination (sending leaflets to neighbors, place of work, children's school, etc. annoying by telephone and mail, threatening families, performing illegal activities under their names, giving false evidence to the authorities, attracting the attention of the intelligence services of the host countries towards these victims, etc. ), tying their hands in bogus court cases (through suing, arranging accidents and bringing other cases against them), and ultimately in special cases to arrange accidents and physical elimination of targets. In the last few months we have seen cases of attempted kidnapping, (one such case is currently going through court procedures in Germany), beating and causing injury (in Netherlands) and many cases of leaflet dropping in the middle of the night against the targets (four cases in Germany and Sweden), character assassination by telephone and mail as well as personal approaches to the place of work, place of residence and the environment of the families of the victims, including children's schools. We have also witnessed cases in which they have used telephone conversations using false names and identities, recording conversation and then adding and dropping things from them before sending them to the police to start some sort of investigation against the active disaffected members. 2- Intelligence work on the Iranian community outside Iran, compiling and updating comprehensive databases. Surveillance and intelligence gathering against Iranian political opposition groups and personalities, especially outspoken critics of the organization, to create a file against them so that they could be blackmailed. These files are tailored according to their situation (adding false or dropping critical information in the middle of huge amounts of correct but unimportant information which has been gathered). This information is used first to inject into the security and intelligence agencies of the EU, the USA and Canada. Then they convince their backers in some western parliaments to support these claims by sending letters of concern to the authorities of the host country. 3- To gather and/or fabricate stories about Iran, Iraq and other countries for the diplomacy section of the organization so that they can use them in press conferences, articles etc. The base of this work is trying to get information over the telephone by pretending to be someone else when they call officials or civil servants. 4- To gather information from 'foreign subjects' including embassies, foreign ministries, interior ministries and immigration departments of the European, American and Canadian countries, private secretaries of some specific members of parliament and some middle eastern countries' embassies in Europe, the USA and Canada. These are also mainly carried out by telephone, email, letters and in special cases following people, taking pictures and even stealing documents. 5- To establish covert contact with fundamentalist groups in every country. To keep contact and data and have these relations ready for a rainy day. What is of utmost concern to us is the MKO intelligence section's primary assignment - to eliminate the activities of the disaffected members of the organization. In 2003 when the French police arrested the cult leader Maryam Rajavi in her hide out in the suburbs of Paris, the French security services announced that they had found documents during these arrests which clearly showed plans to physically eliminate the ex members. It is no secret that according to the teachings of the cult, any disaffection from the organization is considered as treason punishable by death. Up to now these executions have only taken place in Iraq under the protection of Saddam Hussein and not in western societies. But the cult has always refused to overrule these teaching after the fall of Saddam. The HQ of the MKO's intelligence section, after over two years of having a fairly open hand in western countries has now evolved to its full potential, and now the cult's trained 'Fedayeen' from Iraq are carrying out their operations with the systematic backing of a well established network of intelligence agents throughout Europe, the USA and Canada. We are deeply concerned about the security of these disaffected members, many of whom have spent years in Iraqi prisons and, unlike most of their colleagues, managed to stay alive and since the fall of Saddam, to reach a free country. Their and their families' lives and livelihood are in direct and imminent danger. The MKO's intelligence section has received direct and clear order to increase its operations in the form of physical and psychological pressure on these victims by the above mentioned methods and has clearly stated that in special cases "making accidents happen" directly or through paid third parties should be considered as an option. The headquarters of this internationally recognized terrorist network is now working freely from Cologne which is coordinating its bases in Britain, Germany, France, the Netherlands, Sweden, Norway, Canada (at least two bases) and the United States (at least two bases). These bases have already started their operations using various means including bogus 'societies' and 'associations' and other outlets (at least ten such associations have been created recently in London, four in Germany, three in Sweden, fifteen in the USA and many others in other countries which are no more than a cover name. The MKO's intelligence section in Cologne has also created many unidentified websites which are mainly using servers in the USA, are registered in France and are loaded daily from their London base. The network now has more than five so-called consultancy firms registered in the USA and many others in other countries under various names. The number of cover companies for money laundry activities are unknown. We are deeply concerned about the advancement of the threat posed by an imported terrorist network from Iraq not only against the ex members and critics of this cult but also the real threat it poses to the way of life in the free world and the danger it poses to the citizens of these countries. We would urge the authorities of the USA, Britain, Canada and all the major European countries to take this threat seriously and to act to dismantle this network of known terrorists and criminals in their countries. We believe that it is only through the serious intervention of the law enforcement agencies that the self immolations of the kind that we witnessed two years ago in the capitals of some western countries will not escalate to direct suicide bombing and open assassinations. This has happened over and over again in Iraq and Iran and you have witnessed a small scale of it before your eyes in 2003. We believe it is on its way to happening again on a much bigger scale. For more information you can contact us and we can put you in touch with the Iranians as well as ex members who are under threat in your country. We would like to again emphasize the scale and the timing of these operations, some of which have already started, and ask you to take the threat seriously for the sake of all the citizens of your country. We also invite every member of the public who may have any information about this network to either contact us or to give their information directly to the authorities of their country of residence. Firstly, a big thank you to everyone who sent messages of support and goodwill to Elahe following last edition's interview with this great lady. Many people were deeply moved by her story and her courage in sharing it with a public which has previously been too ready to condemn and dismiss anyone who has had links with the Mojahedin. But I hope, after reading this edition's lead article, people will appreciate her courage differently. And I hope too that the courage of all those formerly associated with the Mojahedin and who have, over the years, decided "enough is enough, we must speak out", will also be appreciated in the light of this article. While it may have been possible in the past for some of the Mojahedin's staunchest apologists to dismiss former members' stories of torture and imprisonment in Iraq as exceptions or simply fabrications of Iran's intelligence ministry, the issue has now become a little more serious and the problem a little more dangerous. While Rajavi's Fedayeen operated solely in Iraq and posed a threat only to Iraqis and Iranians, it may have been possible somehow (perhaps dazzled by the glare of Maryam Rajavi's stunning outfits or her matching eyes) to ignore the unpalatable facts. But since the spectre of MKO assassinations and terrorist acts has now arrived on their doorstep, it behoves western supporters of the Mojahedin now to pay heed to what their own security and intelligence agencies are discovering about this threat. They might just find that this is not a fabrication of the Iranian intelligence ministry and is instead the logical conclusion of Rajavi's policy of hatred and violence against all critics of the Mojahedin. The Mojahedin is finding itself backed into a smaller and smaller corner. The Iraqi draft constitution effectively means it would be impossible for the organisation to remain in that country. In any case, around forty MKO in the camp have been identified for prosecution for war crimes, crimes against humanity and terrorism. The actual role of US forces at Camp Ashraf is to secure the MKO from attack from vengeful Iraqis rather than to prevent these terrorists from escaping. It is questionable how much longer US resources can be diverted into this protection when such resources could be so much more effectively deployed elsewhere. In western countries the organisation is not faring much better with Maryam Rajavi and five other MKO leaders still awaiting trial on terror related charges in France, and the supporters of the organisation despondent. The only ray of hope for the MKO – and it is a beacon for the stricken wreck of the organisation – is if it be removed from the US list of terrorist entities following the coming State Department review. The grounds would be, according to Raymond Tanter and the (MKO sponsored) Iran Policy Committee, that since the MKO has not taken part in violent activities in the past two years [bar a self-immolation or two, some attempted kidnappings and beating up of opponents in far-away Europe], and has committed itself to non-violence, it should no longer be considered a terrorist outfit and should be removed from the list. Clearly Professor Tanter has not seen a recent copy of the MKO's Persian language newspaper which still bears the kalishnikov logo and the legend 'Long Live the National Liberation Army of Iran' on its front page. Now, sitting in this ever receding circle, Maryam Rajavi is pondering 'what is standing in the way of the Mojahedin achieving favoured status with the US administration?' Could it be that the propaganda showing her as a popular democratic, feminist leader has not been effective enough? No. Millions of dollars have been spent making sure that message has its effect, and when we read the International Herald Tribune and New York Times, we see that her faith in US dollars is not misplaced. Is it because her ploy of making temporary alliances with the US based Iranian monarchists for the sake of outward respectability has been rumbled? No. They would not admit to being duped by the MKO. Instead, Rajavi has concluded that the only obstacle to being removed from the US's terror list is not 'the truth' itself but the MKO's outspoken critics, most notably the former members who refuse to submit to the organisation's admonitions to stop talking. Admonitions which up until now have in the main consisted of labelling critics as agents of the Iranian intelligence ministry. Now Rajavi has decided the only way forward is to physically intimidate and even eliminate these critics, and she has ordered her newly re-formed MKO intelligence network to take action. It is in the light of this threat that we read Elahe's interview anew and applaud her courage. In August, several websites revealed that the MKO is experiencing severe problems at leadership level in Camp Ashraf. Mojgan Parsai, who was appointed head of the MKO four years ago, nominally placing her third in command after Massoud and Maryam Rajavi, was suddenly relieved of her responsibilities and disappeared. Sources inside the Mojahedin confirmed that Parsai had been negotiating with American forces in the camp to gain refugee status in the USA where she had formerly been a student. She had passed sensitive information to the Americans hoping to be given free passage to America. The real dilemma faced by the MKO is that it is not an ordinary military or political organization. The Mojahedin is a cult which is totally dependent on the autocratic dictates of cult leaders Massoud and Maryam Rajavi to hold it together. However, Massoud Rajavi ran away from Camp Ashraf in December 2004 and is currently in hiding in Switzerland, and his wife Maryam Rajavi is awaiting trial on terrorism charges in Paris. It was the Rajavis' absence that allowed Parsai the freedom to act independently and to attempt to secure her own freedom from the cult. Unfortunately for her, there are many in the top echelons of the MKO who feel they should all live together and die together, so that her bid for freedom was exposed. Maryam Rajavi - who has in effect taken over the cult leadership role from her husband - immediately ordered Parsai removed from her post and began consulting with her advisors in Paris (ex-husband Mehdi Abrishamchi, Mehdi Rezai and others) to devise a suitable punishment for Parsai which will act as a deterrent to others who might also be considering their own future and how to escape the cult. This punishment, based on empirical evidence, can be nothing less than a slow process of elimination through psychological and physical torture. Parsai's removal from leadership of the MKO left the problem of finding a suitable replacement. Maryam Rajavi's difficulty now is that she cannot trust people who are not under her direct command. Since the MKO in Iraq is now defunct as a fighting force and has become a liability rather than an asset, Rajavi saw this need to appoint a new nominal leader of the Mojahedin as an opportunity rather than a problem. She believed that she could solve two problems in one by appointing someone in Paris to replace Parsai so they would be under her direct control on a day to day basis. An MKO leader in Paris would also allow Rajavi to shift the headquarters of the MKO to Europe. By moving the MKO HQ to Paris she could then jettison the people in Camp Ashraf and leave them to their fate. Iran-Interlink predicted this move and suggested that Rajavi would appoint Sarvenaz Chitsaz as the new MKO head in Paris. Chitsaz, also a middle-class former student in the USA who speaks fluent English, has played the role of foreign affairs chief behind the scenes to Mohammad Mohaddessin's public role as NCR Foreign Affairs representative. She is Mohadessin's boss in the MKO/NCR and reports directly to Rajavi. After Iran-Interlink made this prediction public, the MKO announced that its new head would probably be Zahra Merikhi. This announcement was accompanied by attempts to show that Mojgan Parsai was still in place in Camp Ashraf and that she had not come to any harm. However, no-one has actually had sight of Parsai and therefore her wellbeing and safety cannot be ascertained from the MKO's own reports. In preparation to appoint a head in Europe, Rajavi fast-tracked all the Mojahedin's supporters in Europe with intensive ideological teachings [psychological manipulation] with the aim of making them all members of the Mojahedin. In this way, they would vote unanimously for Rajavi's appointed head and the Mojahedin would be effectively reinvented in Europe, allowing plans to dismantle the MKO's Camp Ashraf to go ahead. Iran-Interlink exposed Maryam Rajavi's plan to appoint a terrorist head in Europe. It was clear that European governments would not tolerate such a move so she was forced to back down. As a result, Rajavi's choice for the next head of the Mojahedin was limited to the women in Camp Ashraf. 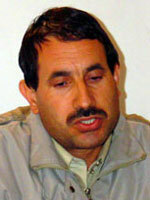 The new Mojahedin leader is Sedighe Hosseini. Born 1957, in Langarood, she was an employee in the city of Rasht when she left Iran in 1979 and joined the Mojahedin in the UK. She married Hamid Farjoud in London and they had a daughter. After the Forough-e Javidan operation in 1988 her husband left the Mojahedin because of the cooperation with Saddam Hussein. Since that time, Sedighe increased her involvement in the terrorist activities of the MKO and was among the tank divisions which killed Kurdish villagers in March 1991. Hosseini more recently led the Fourth Division in Kut, with the specific task of killing Shiites. With Hosseini's appointment, the MKO remains stuck in Camp Ashraf with its terror label and the organization is now vigorously opposing the new Iraqi constitution which will specifically lead to the expulsion of the MKO from that country. On 11th September the newly established Organistie Anti Terreur (OAT) held a Seminar in Rode Hoed Hall in Amsterdam. The Seminar explored the common threads between different terrorist groups; how they recruit, the use of brainwashing techniques and the use of religion. The Seminar addressed how governments can intervene and how society can be 'immunised' against these activities. The Seminar discussed various groups from AL Qaeda to the MKO and their commonalities. Judit Neurink – journalist, ME editor of Trouw, and writer – Ms Neurink has researched and written a book about the foundations of terrorist groups. The Seminar concluded that the Golden Age of using western countries as the backstage for terrorist activities is finished. Whoever commits terrorist activity anywhere in world will be held responsible all over the world. Examples are the conviction in Holland of two intelligence agents of the late communist regime for torture, the conviction in Britain of an Afghan warlord for war crimes, and the conviction of two Algerians in France for terrorism acts committed in Algeria. An outlawed Iranian opposition group, which obtained a permit from the New York Police Department to hold a demonstration in front of the United Nations today, attracted an estimated 2,500 supporters to protest the presence of Iran's president at the annual meeting of the UN General Assembly. 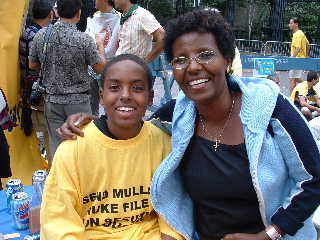 But many of the crowd, coming from Denmark, Germany, Canada, Eritrea and Sudan, acknowledged that they had been recruited by the organization to attend the rally for money, and that all their expenses - including international air fare, hotels, and a daily stipend - had been paid by the organization. Martin Peterson, 26, of Ringe, Denmark, said MEK representatives contacted him recently in his country and offered to fly him and members of his family to New York for the rally. "We thought it was a good cause to support," he said. Peterson said he flew over from Denmark all expenses paid with a group of 70 Danes, and that similar groups had been recruited in Germany and France. their homes in Ottowa, Canada. “Mojahedin-e Khalq organization (MKO) does not have the right to undertake its activities in Iraq, and this decision has been conveyed to them,” former Iraqi Prime Minister, Iyad Alawi, said in an interview with Iraqi television. Another 13 former MKO members have returned to Iran thanks to the efforts of Islamic Republic Red Crescent, International Red Cross and other officials. Earlier, hundreds of other members of MKO who’d left the group’s camp in Iraq returned to the country. Gradual defections reveal the existing deadlock in Iraq. …Sending a letter to European countries, US and Canada, a group of former members of the MKO warned that the group is starting to harass them in western countries using its trained members. The letter said that a number of MKO members trained in security, intelligence and urban warfare courses had been deployed to Europe illegally. I had an interview with Massoud Khodabandeh, former member of National Council of Resistance, who is among the letter's signatories. I asked him about the reasons behind signing such a letter? Massoud Khodabandeh: before the fall of Saddam, the MKO deployed 200-300 of its members along with Maryam Rajavi to Europe. Most of these people were trained in Saddam’s security systems and can be compared to Saddam’s Fedayeen. It seems that this intelligence system has matured during the past 2 years and is now active. For the time being, this system is centered in Germany, with direct contact with the MKO’s headquarters in Auvers-sur-Oise in France. Its divisions are also active in the capitals of other democratic countries. They now have more than one hundred associations, companies and websites to cover-up their activities and they have come to a point, unfortunately, that their activities include kidnapping in Germany, beatings in Netherlands, harassing families and even schoolchildren whose parents are critics of the organization. We sent this letter, signed by 80-90 people, to the Interior Ministries of European countries, the USA and Canada to be investigated seriously. But we should be careful about the process; the way it’s going now would turn the previous self-immolations into future murders and killings and we don’t want this to happen. Interviewer: Mr. Khodabandeh, according to you, these attacks have intensified. What are the goals of such activities? Are they organized movements? In all countries? Khodabandeh: yes, it’s organized by a trained system. Some of them have 20 to 25 year records in this. They were officially trained in Iraq. It means that we can’t ignore it. And, about the goals of such activities: they believe that their problems with being on the terror lists, or being prosecuted by the French Judiciary, are rooted in the revelations made by their critics and by former members. They’ve concluded that they will never relieved [from the terror label] while these people continue to disclose the organization’s realities. So, they spend a significant amount of their energy to suppress, or erase, those who criticize them. Interviewer: What measures can the western countries take? What have they done? Khodabandeh: For instance, a court in Germany is now hearing the complaints of a former Abu Ghraib prisoner who is a critic of the MKO. They [MKO] wanted to kidnap him in the street. The court is doing its work, and that’s a positive step. There have been cases of beatings in the Netherlands but it was not possible to investigate the cases because the MKO agents were able to flee the scene; that’s because, as I told you, they’re trained in this field. But it seems that there are some ways to stop such activities if western governments take this seriously. Anyway, such organized movements are not legal in these countries. Even the lawyers here say that surveillance is not legal. Making databases of opponents is not legal. Harassing people and their children is not legal. Apparently, such activities can be prevented. The only thing is that they should be paid attention to. One of the major news stories today on the Iranian satellite television channel Simaye Azadi was the favorable news coverage the MEK (Rajavi Cult) received on September 24, 2005 in the New York Times and in the International Herald Tribune. Craig S. Smith’s article appeared as “Exiled Iranians Try to Foment Revolution From France” in the New York Times and as “An implacable opponent to the mullahs of Iran” in the International Herald Tribune. Smith included a description of Maryam Rajavi that readers of the New York Times who believed that Fidel Castro was the “George Washington of Cuba” will find endearing: “She speaks volumes on a Castro-like scale….” The New York Times’ support for Castro’s 1959 takeover of Cuba was so strong that the National Review responded by placing a picture of Fidel Castro on its cover with the words: “I got my job through the New York Times”. President George W. Bush employed two major pretexts to dupe Americans into supporting the Iraq War: (1) extend the war on terror to Iraq, a major sponsor of terrorist organizations such as the MEK (2) find and destroy weapons of mass destruction before Saddam Hussein uses the weapons or sells the weapons to terrorists. The New York Times and the International Herald Tribune have published claims contrary to American government reports. On October 13, 2004, Newsweek published “Shades of Gray” by Michael Isikoff and Mark Hosenball. 1. Chief U.S. weapons inspector Charles Duelfer’s report includes evidence that Saddam Hussein allocated approximately $16 million of oil to the MEK over a 4-year period prior to the Iraq War. Saddam Hussein made the allocations using the United Nations-managed Oil-for-Food program. Saddam Hussein signed approvals to add any group to the Oil Allocation Recipient List. 2. The MEK’s response was that Iranian intelligence agents must have been involved with placing the MEK on the list! Quiz: Who is publishing the truth about the MEK: (a) Maryam Rajavi, (b) New York Times and the International Herald Tribune, (c) President George W. Bush, or (d) Newsweek? Whether the MKO wants it or not, many dissident members are leaving this cult. Whether Rajavi and his friends like it or not, many of these dissidents are returning to their families. They are doing what has been banned by the cult. Whether the Organization, NLA and Council confirm or deny the membership of these people, there is plenty of undeniable evidence to prove their long membership in the MKO and the so-called NLA - most important of which are the individual interviews by the US State Department with them in Camp Ashraf, taking photos, DNA samples, fingerprinting and issuing ID Card for them. The wave of returning members are not coming from a round-the-world tour to tell us the story of one thousand and one nights! As they say, they’re coming from “a hell in which a minute equals a year” and that’s why they have a lot to say. The memories and stories told by these people are the most tragic things we may hear for the time being. They have stories of filthiness and treachery, of an anthropoid plundering the entities of human beings, of crimes and captivity and…. Most important are their revealing stories which disclose the dangerous and inhumane nature of Rajavi’s cult. In the late 1990s, the MKO faced a situation which can be called “the crisis of membership”. The Organization had reached deadlock and members were no longer dynamic. Its forces began struggling against each other and the organization had to do something. One member would compare himself with another who had entered the organization at the same time as he had but was now his superior. This person would disobey his commanders, and this was a poison for the iron discipline of the Organization. So, the organization had no way except to recruit new forces, so that the members could attain higher ranks in order to prevent friction between veteran members. As ever, the organization looked for ideal forces in order to preserve the internal atmosphere. So “Sahar (Dawn) Operation” was conducted in 1999. Massoud Rajavi said that every base which could recruit new forces would be given privileges. So, they asked all members to call on their brothers, sisters and relatives to come to Iraq. But in practice, it was too difficult because those who had left the country 20 years ago had no one inside the country to recruit. Then, with the help of smugglers, they sent back some new members into the country; but they could only recruit a few. It proved extremely difficult for the organization. So they activated smugglers. First they asked smugglers to take its members into the country. Then the reason was explained to the smugglers and they were promised money if they brought new forces for the organization. A deal was cut with the Kurds, Arabs in Turkey and Pakistanis. Smugglers were trained how to capture the forces. Contacts, like Sedigheye Mojaveri in Europe, helped the project by making calls to young people in Iran and trying to deceive them. Some people like “Ali Ankara” in Turkey were responsible for coordinating the illegal transfer of kidnapped people to Iraq; and this is how the process of kidnapping and human smuggling was completed. Smugglers were employed to actively bring new forces for the organization using deception and tricks. They did this only for money. They did everything necessary to accomplish their task. They brought very young persons, girls, poor ones; they were promised good work and a salary, education, residence in Europe; their emotions were aroused and …. Some of them didn’t even know where they were going, until they reached Baghdad and found themselves in the camps of Mojahedin. This was what the Mojahedin wanted, and smugglers were trained to do it efficiently and effectively. They were trained what to say and what not to say. One of the most active persons in Turkey was “Ali Ankara”. These people were taken to Iraq to fight. They were taken to Iraq to work as slaves. 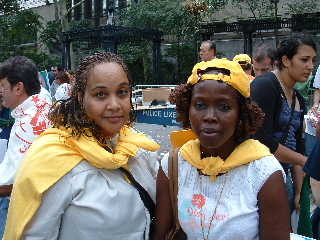 Even their families were not aware of their whereabouts since the organization didn’t let them make contact. Their families thought they have been lost. Of course, this method is not exclusive to the MKO, and has been used by other dangerous groups like the Khmer Rouge. This approach has been has been condemned by world communities. Generally, the world is very sensitive towards the issue of human smuggling and this crime of the organization has mostly remained hidden otherwise there would have been necessary measures against them. This issue didn’t remain hidden from the MKO's veteran forces. The MKO held ceremonies in which its new forces stood on the platform and explained how they came to join the organization. Some of them, who were braver than others, revealed the process of deception for others. Veteran members, becoming aware of these issues, stood against the organization. It made no difference for the organization how the new members were taken in. They claimed that “sister Maryam’s revolution is so powerful that it absorbs all those who have come here, apart from their intentions. It is enough to be here for only a month, and you will join the revolution.” But events didn’t go as the MKO wanted, and some of the new members started opposing the organization from the first day of their arrival and disrupted the MKO’s equations. Some of these people can be found among the former members who recently returned to Iran. The Organization claims they were never members of the organization. It also says that these people had announced that they were not ready to bear the conditions of struggle and that they wanted to return to their normal life. No surprise; when a person is kidnapped and taken into the organization, he/she certainly won’t cooperate. But these very forces had to work as slaves for the organization and if they wanted to leave, they were told that they should spend two years in the MKO’s prisons and eight years in Abu Ghraib prison. Then, the US soldiers arrived and the situation changed. Brief interviews of returning former members are full of examples of such behaviour. Two such interviews are published here. The names of other who have been interviewed are listed at the end. The latest witness to the medieval tortures of Rajavi’s Inquisition Courts, the latest one able to flee from the cage, like other defectors from the Mojahedin-e Khalq, risked his life and took refuge with the Red Cross. Taj Mohammed Zare’i, who was with the Mojahedin for 17 years, has returned to Iran with his wounded and hurt body only to tell us, “I proved that they can’t convince me forcibly”. 150 individuals started beating him in order to show him Maryam’s revolution with more effective blows. They beat him so much that he passed out. He came to on a hospital bed. The MKO kept him away from the eyes of others to force him to sign a paper stating that he had been wounded in a personal case. Finally, by coercion and threats, they succeeded in getting these papers. I’m Taj Mohammed Zare’i. I started military service in Iran in 1986. I had passed 20 months of my military service when I was captured by Iraq in an operation and I was in prison for 20 months in Tikrit. There, prisoners were abused and tortured. On the one hand, MKO offered attractive inducements. For example, they said that you can come here beside your compatriots and then return to Iran and … on the other hand, we were under the pressure of Saddam forces. Anyway, we made the wrong choice and joined the Monafiqin (hypocrites, a name commonly used for the MKO in Iran). At first we were attracted by them and thought that they’re really good people. But after a while they showed up their hypocritical face. For instance, in the event of suppressing Kurds and after the Kuwait war I myself witnessed the MKO’s cooperation with Iraqi forces. They attacked Kurds with artillery and tanks. Everything was prepared for the fall of Saddam’s regime but the MKO prevented it. They cooperated with Iraq’s Mokhaberat (former Iraqi secret service). Wounded Kurds captured by the Mojahedin were immediately handed to Mokhaberat – which killed them and buried them on the spot. Others were taken to be investigated and then executed. The MKO also tortured its own forces. In 1994, I saw many MKO members tortured and imprisoned by the organization itself. Their torture methods are unique. When I saw these things, I asked to leave. They didn’t let me go and I had to stay anyway. In 1995, Massoud Rajavi held an assembly called “Hawz” which was an ideological assembly. In this assembly I said that I didn’t accept their ideology. I said that you can do anything you want but you can’t force me to accept your ideology. This public assembly was held in a place called “Bagherzadeh”. After we returned to Camp Ashraf, in meetings supervised by Mehri Aligholi and Jahangir (Parviz Karimi) they asked me to stand on the platform and explain why I didn’t accept their ideology and why I disobeyed. Here, I repeated my words again. I said that they can’t force me to believe in what they desire. In this meeting, the people who were there attacked my by the order of Mehri Aligholi and beat me very hard. I passed out there and when I opened my eyes I found myself in the hospital. I was hurt in my eyes and waist. My testicles were also badly hurt so that my right testicle was operated on. I also suffered a slipped disk, and there are also other wounds on my body. After this event I was hospitalized for 6 months. At the same time, they took me to see a person called Nader Rafi’ee Nejad who was said to be the head of the judicial commission. They said he wanted to follow my case. He said that your case has been a personal case and you should write this and sign it. I refused to do so. For three days, he followed me and pressurized me to sign the papers. Finally I had to sign them because I had no other way. I should also say that they kept me in an isolated secret room, out of the sight of others. Only a doctor came and checked me. The bottom line is that they have committed many crimes. Lots of people have been killed by them and there’s no sign of them. Their fate is not clear and no one knows what the MKO has done to them. I was with the Mojahedin for 17 years, up to a few days ago when I decided to return to my country after I had heard that the Iranian government has issued public pardon. Finally, I entered the country and I’m so happy to be here and to be with my family. I hope that all my friends at Camp Ashraf and the American Camp will be freed soon. I’m Hessam Shakeri Sabzevari, born in 1980. I was an athlete and I wanted to continue with my exercises and training, so I left Tehran in 2003 and went to Turkey. I started working there. I was a coach there in a club. After a month and a half, I became acquainted with an organization the members of which came repeatedly to me and said that I could continue my exercises and also get paid well. They said that they would eventually send me to Europe. They even told me that I could stay with them for three days and then I could decide whether to stay or leave. They asked me to visit their gym and their work. They told me that they would provide the best exercise and entertainment club. I was struggling with myself. They said I’d be given 'political' status since my name would be added to their political list. Then, they said, you’ll be able to go anywhere in the world because you have a political case. Exercising was everything for me and I wanted to achieve my goals, so I accepted to go and check out the situation. I said that if it’s not OK, I would return to Turkey. They accepted my condition. Then they said that their base is in Iraq and we should go there. We moved. Arriving in Iraq, we went to a hotel to rest for some time. After lunch and at about 4 pm, I asked about their gym. I wanted to exercise. They said the gym is downstairs and we should go there. I went and what I saw was a ping-pong table and table soccer… I became angry and said "is this the gym you were talking about? Where are the exercising tools? I’m a bodybuilder not a ping-pong player". They said that they had told me that there’s no place for exercise, wife and life. I said I don’t want wife and life; I only wanted to be able to exercise. For about 12 days I was struggling. They said I should sign some papers to join the organization. I refused. They said I would have to join their organization in the end. They also said that they would send me to Abu Ghraib prison for 2 years. There, after being tortured, I would be exchanged and would be sent to Iran. “In the case of returning to Iran, Intelligence Ministry will kill you since you have been here with us. And we will announce your name as a traitor and agent of the Iranian intelligence ministry,” they said. I was frightened because I had done nothing and now I was being labeled as a terrorist. I didn’t know what to do. From bad and worse, I had to choose the bad. I said to myself that I will go forward so that I may find a way to escape. I accepted to sign the papers. They completed the documents and sent me to reception. There, I found that life there is really hard. I had to wake up at 5 in the morning. They discussed political issues. They spoke about revolution, history and …. I was really tired so I said that I can’t stay here. This time they took me to a room where four men (Reza Moradi, Saeed Naghash, Saeed Khodayee Sefat and another man) started insulting me. Reza Moradi put his rifle on my head and said he would kill me if I move. I decided to side with them until a day when I can find a solution. Then the invasion of Iraq took place. I saw that even then it was not possible to escape since Iraq was not safe at all. War was everywhere. It wasn’t clear whether one could survive. After a while, US forces came to the camp and said that everyone who wants can leave now. In the MKO’s camp I couldn’t eat because my diet was different. There, they added salt to all the foods and I got high blood pressure. When I protested and said that I have high blood pressure, they said they don’t care. I said my diet is different. For eight months they gave me potato and tomato. My weight had dropped from 125kg to 85kg. I had to eat yogurt and dates and bread. But the bread was also full of salt. But I had no way. Once they held a meeting for me and said that I should not exercise. After the US invasion of Iraq, when the organization's arms had been submitted to the US, they told me that I could exercise but at a very low level. Our food was again tomato and potato. I was unwell so I showed myself to a doctor. He said that I have high blood pressure and malnutrition. This was the Mojahedin's gift to me. These people have agreed to act as witnesses in any trial or tribunal to bring the MKO leaders to justice, they are willing to speak to anyone investigating the allegations of human smuggling and human rights abuses by the Mojahedin.